Order of Hunters, or Order of the Ancients, is a cultist branch in AC Odyssey DLC, Legacy of the First Blade. They are a new cultist branch, and they’re still up to no good. As a result, you’ll have to find and hunt down the Order of Hunters in Legacy of the First Blade. So, where do you find the members of this branch of the Order of the Ancients? Fortunately, you’ll find some of them by playing the story missions. However, not all of them will be so easy. So, here’s our AC Odyssey Order of the Ancients – Hunters Cultist Branch Locations guide to show you where to find the new cultists, and how to get them. Where to Find Timosa the Physician Order of the Hunters Cultist? To find Timosa the Physician, all you have to do is play the main story missions. She is even the first cultist that we ran into. Specifically, you’ll run into this cultist during the mission called Mysterious Malady. You start this mission by going to the town of Potidaia (marked on the map below). Talk to the magistrate to start the quest chain, and follow it until the end. At the climax of the mission, you’ll have to choose to accuse the magistrate or the doctor. By the end, one cultist will be down, and you’ll get a clue for the next one. Phratagoune the Keeper can be found in the central north of Makedonia. We got the clue to her location after we defeated Timosa, described above. After that, all we had to do was reveal Phratagoune as a cultist, and follow the map marker. We found her out in the wild, near a bear den, hanging out with her ursine pet. Needless to say, you’ll have to defeat both her and her bear. It’s a bit of a rough battle, so approach it carefully. You can also go into the bear den itself and kill more of them to get bear pelts and other stuff. 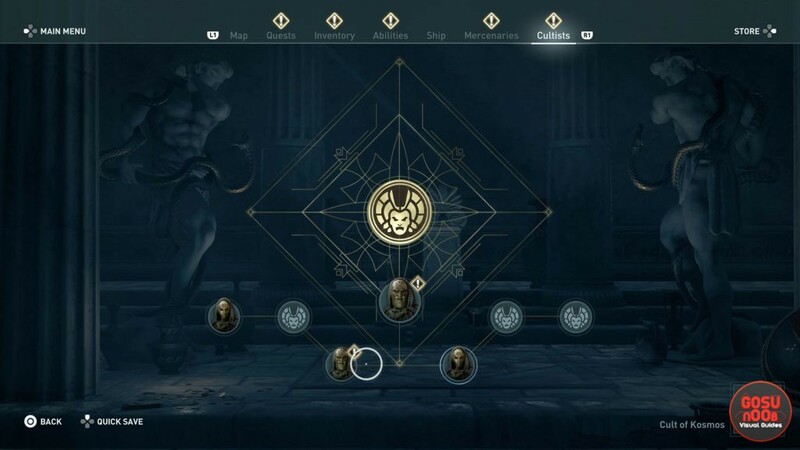 AC Odyssey Order of Hunters Konon the Fighter – How to Find? Konon the Fighter was one of the easier cultists to locate and kill. The clue was with Phratagoune the Keeper; we got it after beating her and confirming the kill. Once you reveal Konon as a cultist, the game will show you his location. He’s in northeast Makedonia, in a camp called Xerxes’s Sacrifice of the Nine. You’ll spot him easily; he’s a big, bald brute, dressed like a roman gladiator. Just be cautious, because he has soldiers as backup. As is always the case with cultists, make sure to confirm the kill at the end of the battle. How to Get Echion the Watcher Order of the Ancients Cultist? To get cult member called Echion the Watcher, you have to follow the Dead Man Rises main mission. During the quest chain, you’ll have to get five bear pelts. That’s why I mentioned clearing out the bear den when hunting for Phratagoune. Anyway, when you get the pelts, the game will then direct you to a blacksmith assistant. He’ll require to give him a password, or code, as he puts it. You’ll have to answer correctly; if you fail, you’ll have to kill him. Oh, no. For the exact answer, check out our Blacksmith Code – What to Answer guide. However you solve it, you’ll get the clue to Echion. Oddly enough, he’s close by, right there in northeast Makedonia, in the Asklepion. Kill him and his posse, confirm the kill, and be on your way. To unlock Bubares the Conspirator, you just have to play through the Revealing the Recruiter Legacy Mission. It’s a straightforward string of quests; you can complete it in like twenty minutes or so. Bubares is surrounded with high-level enemies, so don’t just waltz in unprepared. Although, at this point, you’re probably really well equipped to handle them. Either way, murder them all (or turn some to your cause), confirm the kill of Bubares, and you’re ready to roll. Akantha the Deceiver Order of Hunter Cultist – How to Discover? To discover Akantha the Deceiver, you have to find a clue in Olynthos Fortress. You’ll run into it during the Revealing the Recruiter quest chain. It’s in the same room with one of the documents you have to collect for the mission. Reveal Akantha, and you’ll learn that she’s in the Leader House in northeast Makedonia, near the Asklepion. When you come for her, she will start running away, so you’ll have to hunt her down. Probably a good idea to attack during the night, so that you have a chance of getting a jump on her. To reveal the final Order of the Ancients cultist of the Order of Hunters, you have to complete the Protector of Persia main quest line. For all intents and purposes, Pactyas the Hunter is the final boss of the DLC. The quest marker points to a forest in the middle of Makedonia, just above the letter T in “Unexplored Mount Pangeon” on the map. This unlocks, as far as we can tell, after the Whimpers in the Fog quest. Anyway, prepare yourself for an epic, prolonged battle, as well as for the final cutscene of the Legacy of the First Blade DLC.